Good. 0330301276 inscription on first page. 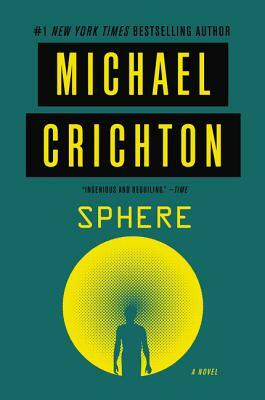 I really enjoyed reading this Crichton. This was one of the first of his that I read, and it really made me want to keep reading all of the way through. The conflict was really interesting, and the plot twisted the whole way through. I don't think I could've predicted a single thing besides maybe the ending. The way Crichton wrapped it up wasn't great. Other than that however, I really enjoyed it! as you think it, so shall it be. A company laying cable across the ocean floor have their cable cut by some unknown object. The navy is called in to investigate. With deep submergable mini-subs and robots, they discover a large object on the ocean floor. It is a space ship. From the coral found growing on it, it has been down there for at least three hundreds years. The navy builds a habitat next to the space ship so personnel can live at the bottom of the ocean while investigating this phenomenon. Four scientists are recruited to investigate and unlock its secrets. When they open the space ship, they find all instructions in English. It turns out that the space ship is American from the future that has gone through a black hole and has wound up in the past. Inside the space ship is a sphere that evidently was captured by the space ship. what is the sphere? A great story from a great imagination. This is book is a mystery combined with adventure as well. This book kept me on the edge of my seat the whole time. It's an excellent book, Michael Crichton did a great job. He didn't reveal everything, making you think a little, and leaving it to your imagination, which made the book that much better.